"HIYHF offers the chance to place students in that time period that they are studying!" “ Often times our scholars are not able to analyze primary source artifacts from ancient civilizations and with your organization, my 115 scholars have now been able to engage in artifacts from Ancient Rome and Ancient Greece. My scholars were actively engaged in the material and were able to ask questions to HIYHF, Mr. Berk, who was very informed on the history." "Having the opportunity to get their hands on actual historical documents is vitally important for kids to take something that may seem abstract and understand it in a more concrete way." “ HIYHF was such an easy and effective way to integrate real historical artifacts into our unit on Maps. Our kids were so excited to see real examples of maps from throughout history. And the fact that HIYHF came to our classroom and provided so many materials was so helpful to my lesson planning! It's like a field trip in your own classroom!" "It was a unique and engaging experience to have our homeroom turned into an interactive museum for that afternoon." “The material brought into our 4th grade class was reflective of what a child's imagination would conjure when thinking of old maps. The imaginary lakes and islands, the sea monsters, and the skewed projection of the world as we know it today, captured the attention of the students in a way that stands out from any other history based activity we had done all year. The students were able to view and handle old maps, some of which dated back to the mid-16th century, and come up with questions and observations to be discussed with the presenter in both one on one and group settings. It was a unique and engaging experience to have our homeroom turned into an interactive museum for that afternoon." 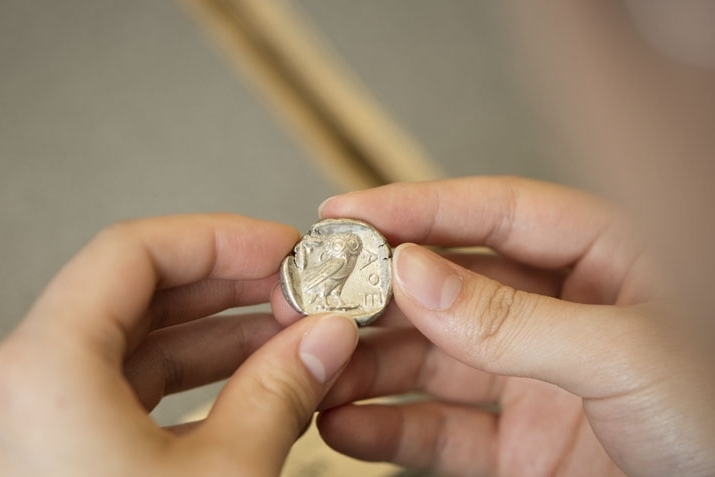 "Holding a coin that was held by ancient Greeks or Romans connects students to the ancient world in a way that a history textbook cannot." “As a result of the History in Your Hands Foundation, my students started to identify bias and in early map making. My students no longer see historical maps as objective information but rather as tools to promote an agenda. Recognizing the point of view, purpose and audience of these maps will make my students more critical readers and consumers of contemporary media as well." 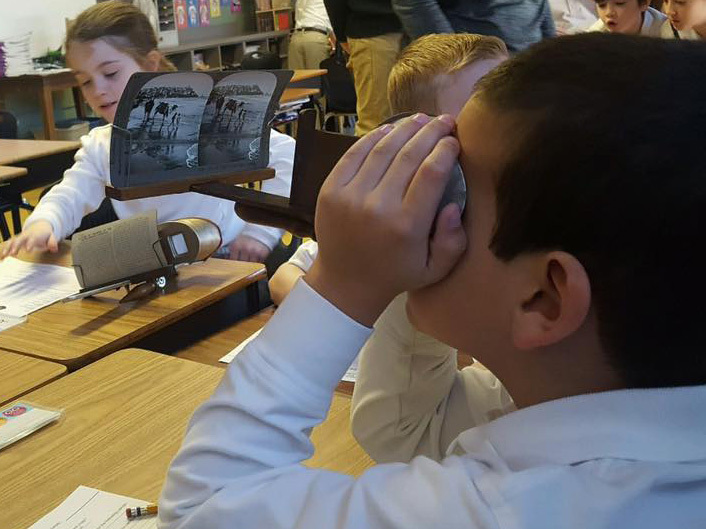 "My third grade students loved getting to actually touch historical objects, instead of viewing them behind glass cases." “ As a teacher, I loved it because HIYHF prepared everything ahead of time. They came into our classroom and set up four stations with many objects from the Jesus-Roman period (what we were learning about in class!). The students spent time inferring what they thought the objects might have been used for, before being told the objects' true purpose. All in all, it was a great experience. We still refer to the "Land of the New Testament" ancient map copy given to us as a gift at the end!" "I hope to make a visit by History in Your Hands a part of my curriculum every year!" “ The kids really enjoyed your visit and I did as well. I’d really like to make this a yearly thing going forward. It’s a terrific way to end the year in social studies. Both the students and the teachers loved having History in Your Hands come visit Frances Xavier Warde (FXW). While the kids enjoy going to museums to see artifacts, they thought it was much cooler to actually hold/touch items that people had used hundreds or even thousands of years ago."